What are the origins of Aromatherapy? Aromatherapy as we know it today is less than 100 years old, but its roots can be found in the pages of the earliest volumes of world medicine. It is a natural, non-invasive technique that uses a plant's essential oils to help the body heal and maintain itself by way of the body's own natural abilities. These oils are extracted from a variety of aromatic plant materials including grasses, leaves, flowers, needles and twigs, peel of fruit, and wood and roots, each containing its own mix of active ingredients. This mix determines what the oil is used for, and how it can enhance the individual's innate healing process. 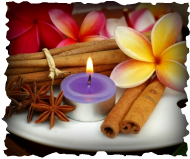 As an holistic practice, aromatherapy works at integrating the physical and spiritual aspects of being in the world. Some oils are used to treat specific physical symptoms, others are used for their mood-altering qualities, working together to restore balance and harmony to the body as a living system that is in turn part of larger living systems. In the modern era, the word first appeared in print in 1937 in the book Aromathérapie: Les Huiles Essentielles, Hormones Végétales, by René-Maurice Gattefossé. Gattefossé was a French chemist who in 1910 burned himself badly in an explosion in his cosmetics lab. His hand developed gas gangrene, which he treated with extract of lavender. The burn healed without infection and with no visible scar. The results so intrigued him that he pursued them as an avenue of research, and, as a result of Gattefossé’s experiments, Dr. Jean Valet used essential oils to treat injured soldiers during World War Two with great success. Such was aromatherapy's modern incarnation, but it is in many ways a return to the very basis and foundations of medical practice. One of the earliest and most influential medical books in history, the five-volume De Materia Medica, produced in CE 65, described between 500 and 600 plants, along with their medicinal use as oils. Its author, Pedanius Dioscorides, a surgeon in the Roman Emperor's army, compiled his herbal encyclopaedia as a result of his travels through Greece, Crete, and Egypt, and it remained in continual use in the West through the sixteenth century, a basic text of herbalism and one of the first systematic treaties on the use of plant oils for healing. In the eleventh century, Avicenna, whose own 14-volume Canon of Medicine was influential for many centuries through Europe and the Arab nations, extending even into China, advanced medical practice -- and the future of aromatherapy -- through the invention of steam distillation. Though distillation per se has been traced back as far as 3000 BCE, Avicenna's development of steam distillation became the foundation for the extraction of a plant's essential oils, and hence the cornerstone of Gattefossé's own twentieth-century research. Before there were modern pharmaceuticals and synthesized drugs, humankind's medicines came directly from the plant and animal worlds, directly from the biosphere -- of which humankind was and still is an integral part. In steam distillation, steam is pumped through the plant and herb material under pressure, softening the cells and allowing the essential oil to escape in vapour form -- which is then condensed back into fluid form. All types of plant parts, including buds, leaves, bark, and roots, can be processed by this technique, and it remains the most popular method used to extract essential oils. In contemporary practice, essential oils are absorbed into the body in two ways: through the skin and through the sense of smell. Applied to the skin by way of massage, compresses, or bathing, the molecules pass into the bloodstream, where they are circulated throughout the body, interacting in the blood with hormones or enzymes. As aromatics, they are inhaled through the nose and transmitted via the olfactory bulb to the limbic system. The olfactory receptors in the nose communicate with those parts of the brain -- amygdala and hippocampus -- that serve as storehouses for emotions and memories. Inhalation of the airborne molecules stimulates these areas of the brain and can influence mood and cognitive function. Some practitioners of aromatherapy emphasize the idea of the individual life-force of the plant, each plant with its own particular manifestation of that all-encompassing life-energy that today we might call Gaia, and the interactions with that plant's energy-force promoting health by purging negative vibrations and restoring balance to the body's own energy field. For this and related reasons, products that include synthetic ingredients are frowned upon in holistic aromatherapy. Perfume and fragrance oils, by way of example, contain synthetic chemicals, which are not the same as essential oils, and that do not provide the therapeutic benefits of essential oils. In many ways aromatherapy encompasses some of the oldest practices of medicine -- and of pre-industrial understandings of humankind's relations with the bio-energetic flow of the planet -- filtered now through the analytical methods of modern science. Aromatherapy is a means of approaching and rediscovering in 21st-century terms the unities of body, mind and nature.